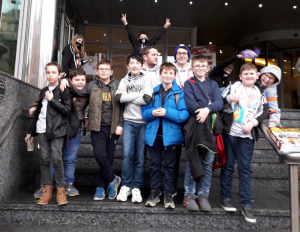 On Sunday 3rd February 2019, the Wicid Editorial Team went to the Cardiff Anime and Gaming Con at The Mercure Hotel Cardiff. There was a big group from Llanhari School, my brother and I (Nathan) from Tonyrefail and one from Garth Olwg. The convention was over 2 days so we came for the second day which was still really busy! We got to the venue at 10:30am, ready for when they opened the doors. We walked into the main hall on the ground floor and we were immediately blown away! There was anime stuff and wrestling stuff and there was a big shop full of food, toys, shirts, wallets! This was a BIG convention, spread over 4 floors. There were regular clothed people who were there just browsing and anime cos-players who looked great! We stayed on the ground floor for a little while, checking out the wrestling stuff before making our way upstairs. We skipped past the first and second floor and went straight up to the third so we could check out some video games. They had everything, PC’s, Nintendo Switches, Xbox 360’s, Xbox One’s, Playstation 4’s, Playstation 3’s and so much more! There was even a room where you could try out retro game consoles like Sega Mega Drives, Nintendo 64’s and Super Nintendo’s. We didn’t get a chance to check out the first floor, they had a big room full of different acts through the day including a best dressed competition for all those who dressed up. Maybe next time when we have more time we’ll be sure to check it out. Unfortunately the time came for us to leave but we really didn’t want to, it was so much fun! Overall, I really enjoyed it, thanks to WICID and YEPS for giving the Editorial Team the opportunity. Hopefully, the Editorial Team can go next year as well. Iestyn – I was expecting the gaming area to be bit bigger because it had it’s own floor, but overall it was really fun and interactive. My favourite part was the light-saber training where Calum, Dewi and I were able to train as Jedi’s and make new friends along the way. There were loads of items for sale but they could have been a bit cheaper as they were very expensive. Ashton – I liked the stalls in the convention area as there was so much to choose from. There was so many games for us to play on and not only that there were different type of games to play such as Halo, Super Smash Bros and old consoles as well with Sonic The Hedgehog and Mickey Mouse. It was a different experience because I have never been to something like that before. They could improve the event next year by having more places for us to go to and more types of games. Osian Allen – It was a good event and I enjoyed but there were a few flaws that I think they can improve on for next year. More stalls would be great and not so expensive!! I was disappointed they didn’t have any Atari Consoles and only 2 Nintendo Switches which were very popular so there always a queue to get on them. But once you were on they were great! Thanks Catie for taking the time to read my article.